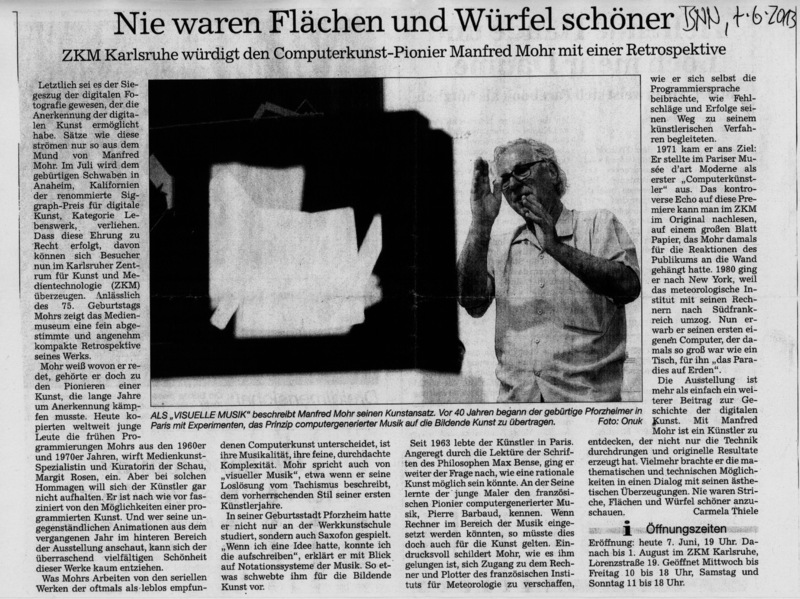 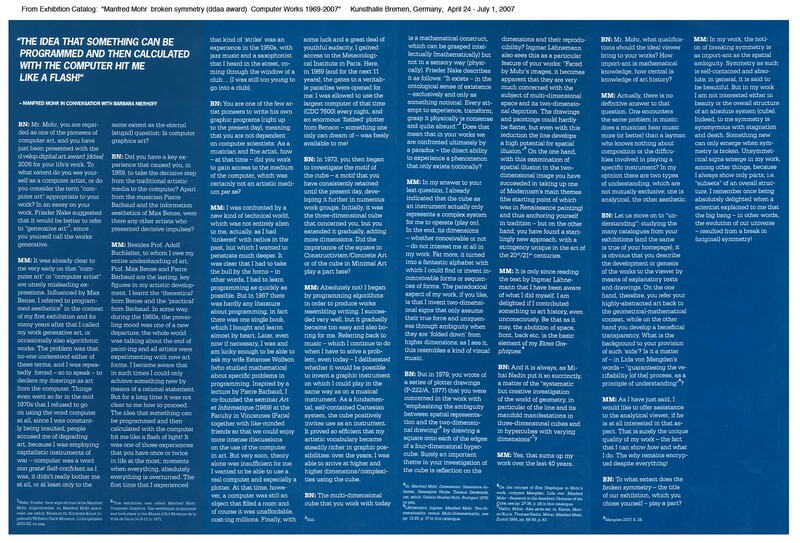 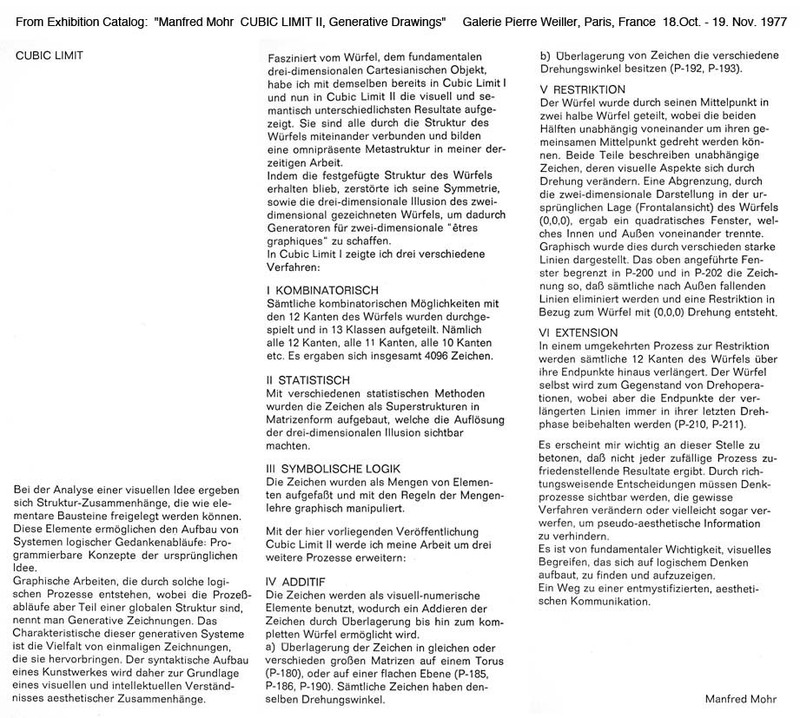 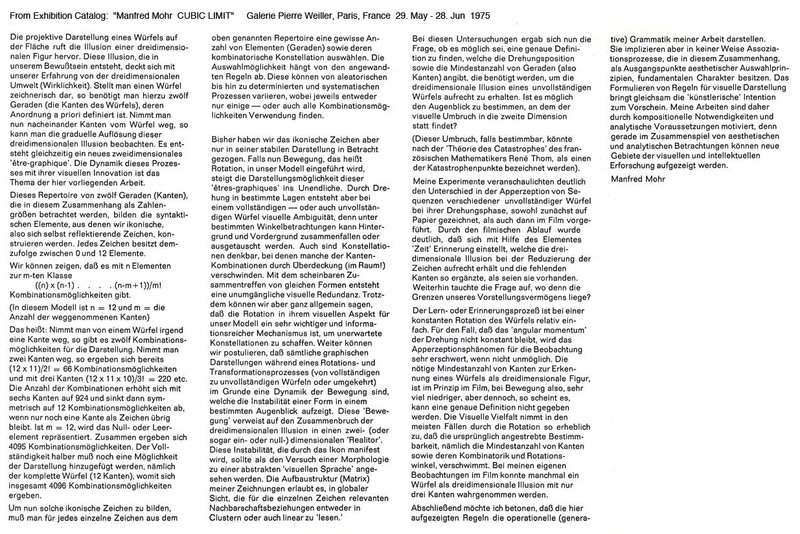 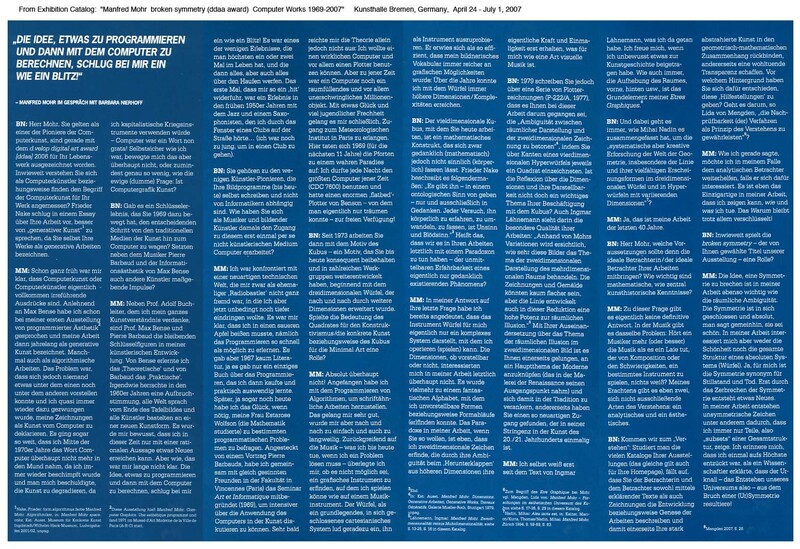 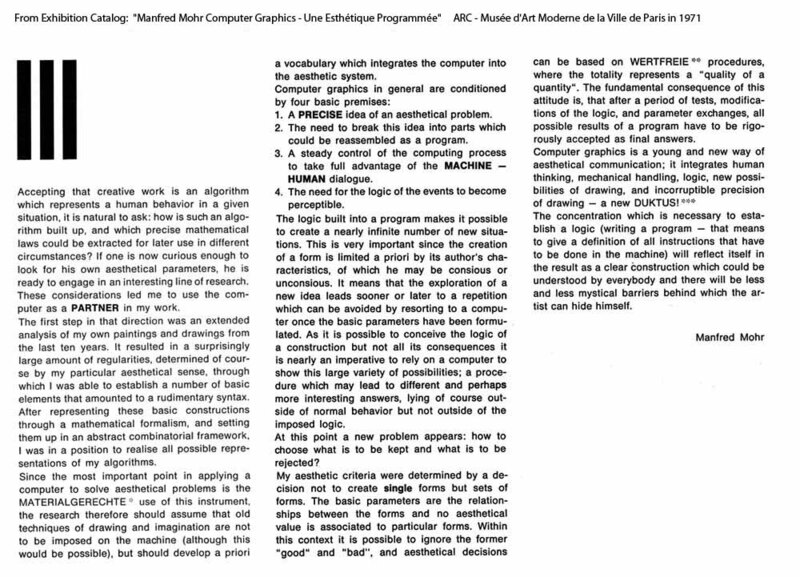 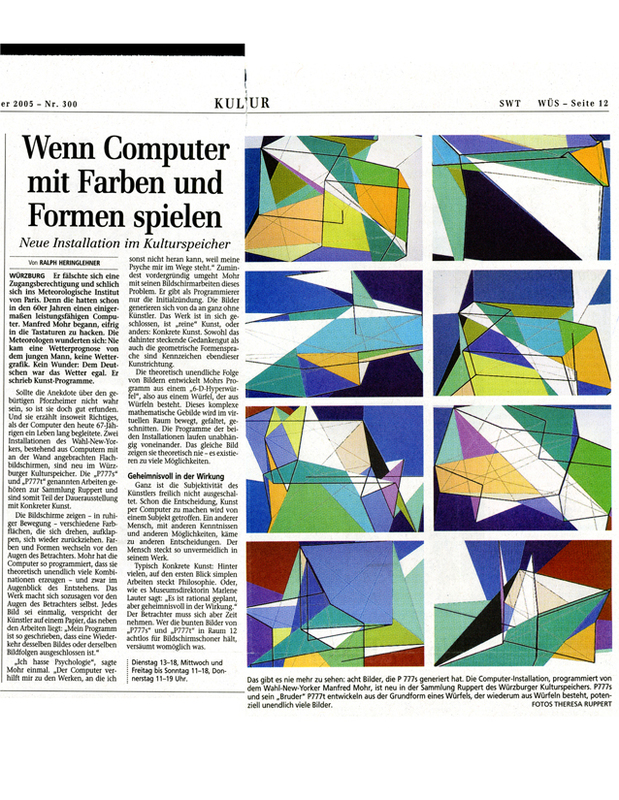 from press about exhibition "Manfred Mohr: Computer Graphics - Une Esthétique Programmée"
from Catalog "Manfred Mohr: Computer Graphics - Une Esthétique Programmée"
- Dr. Bernhard Holeczek, Wer hat Angst vor Manfred Mohr? 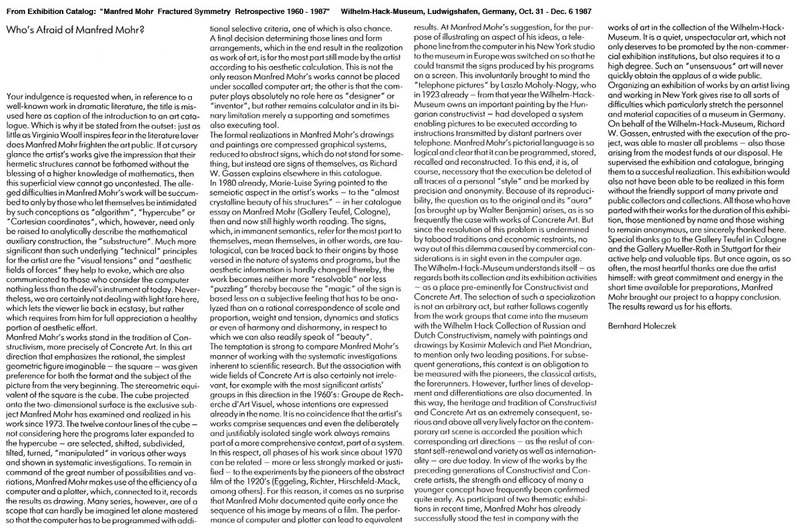 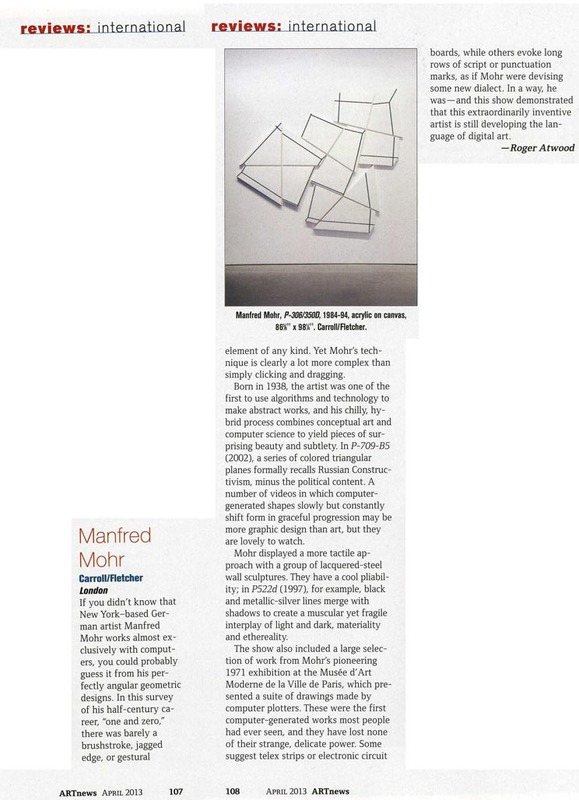 / Who's afraid of Manfred Mohr? 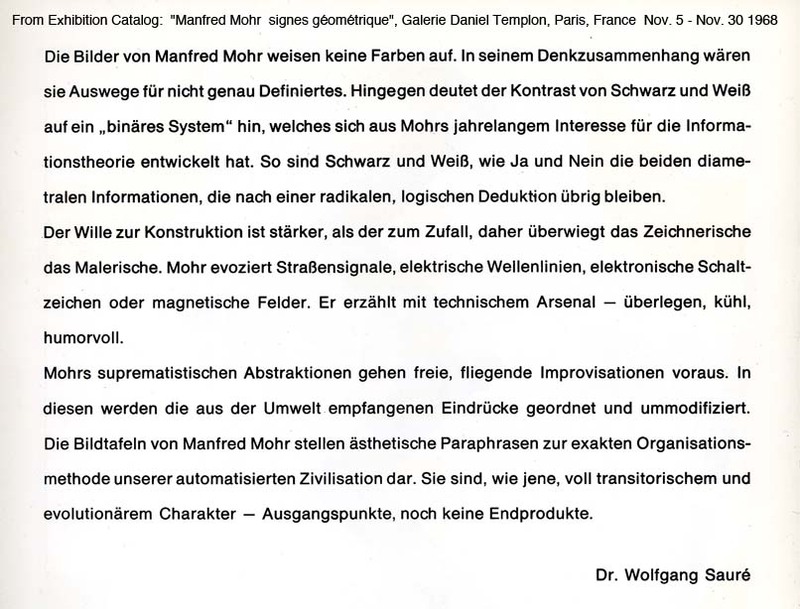 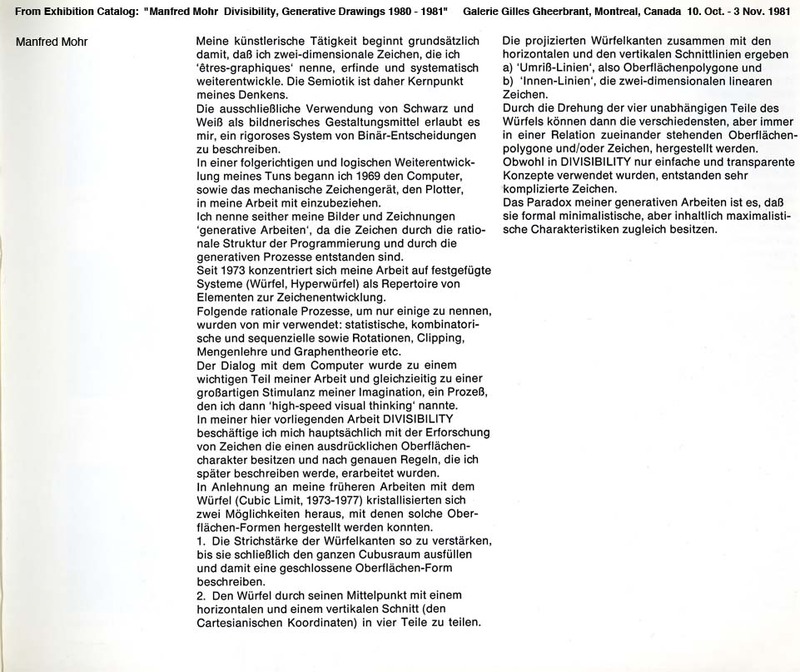 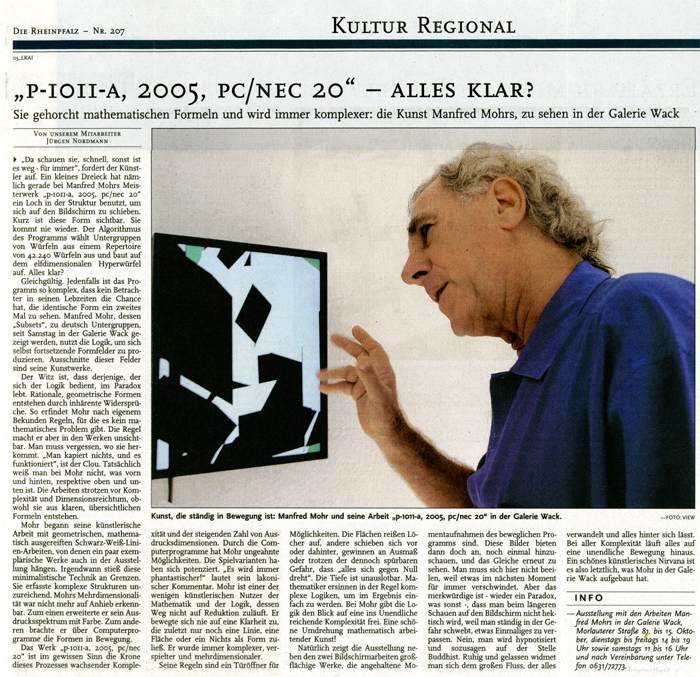 Jürgen Nordmann, P-1011-A, 2005, PC/NEC 20" - Alles Klar? 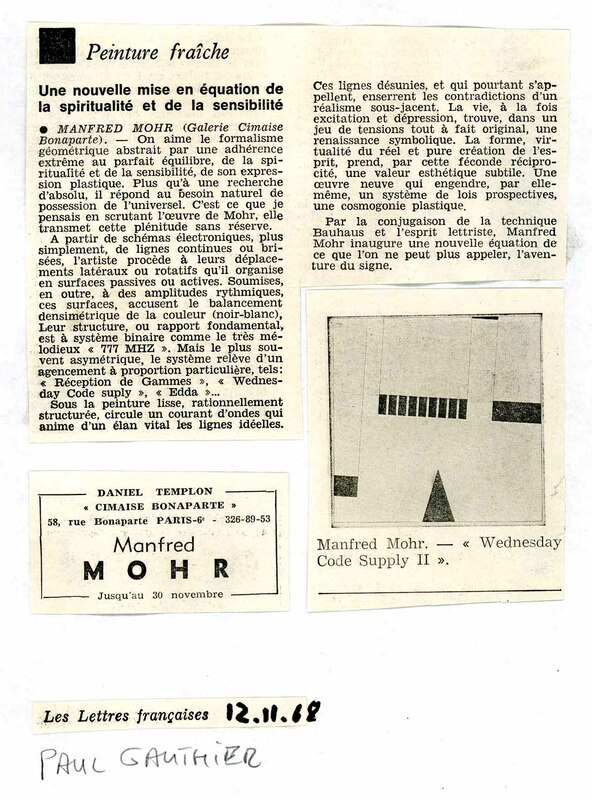 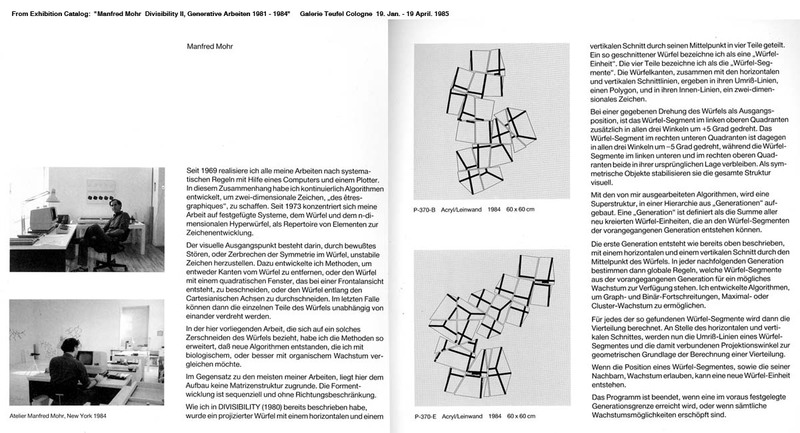 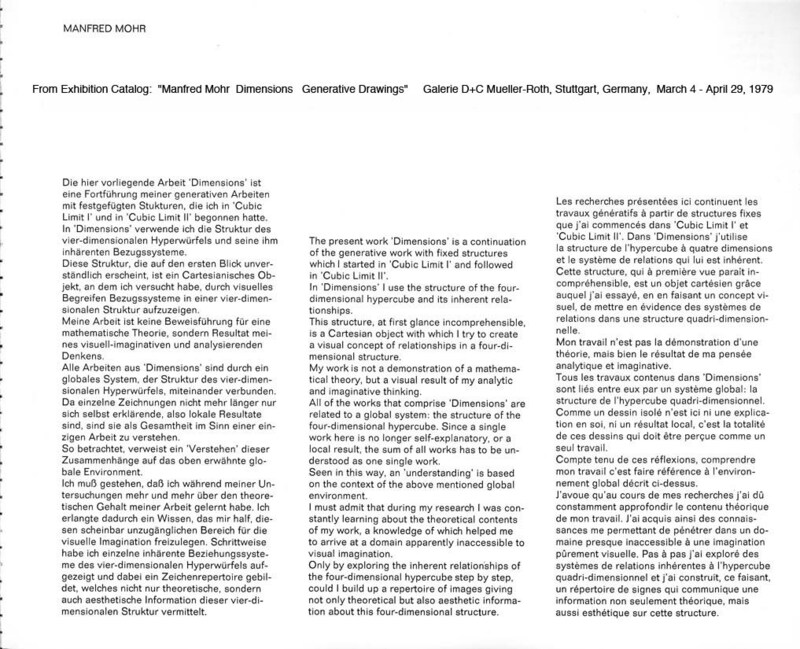 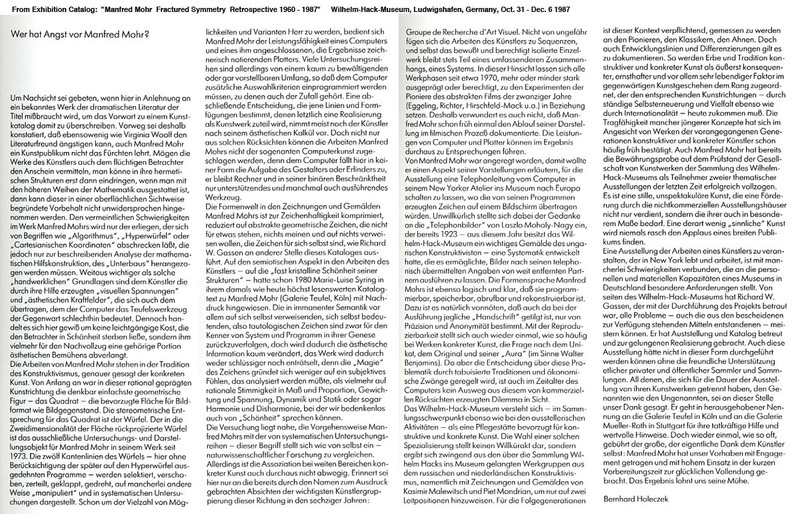 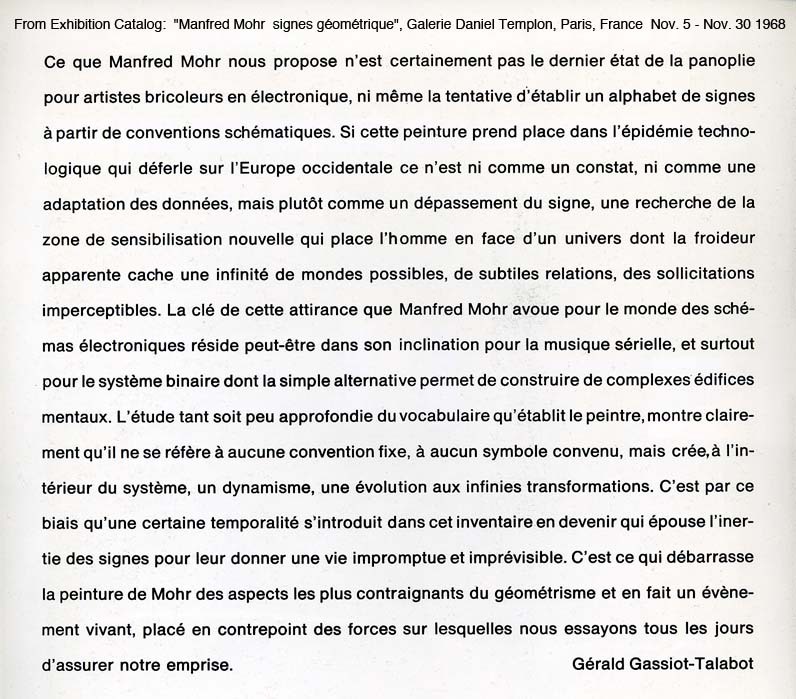 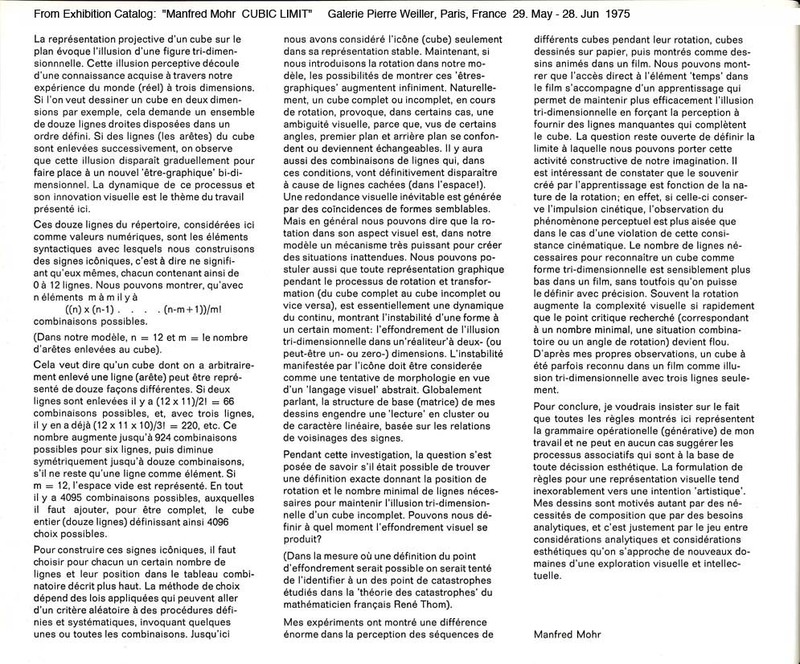 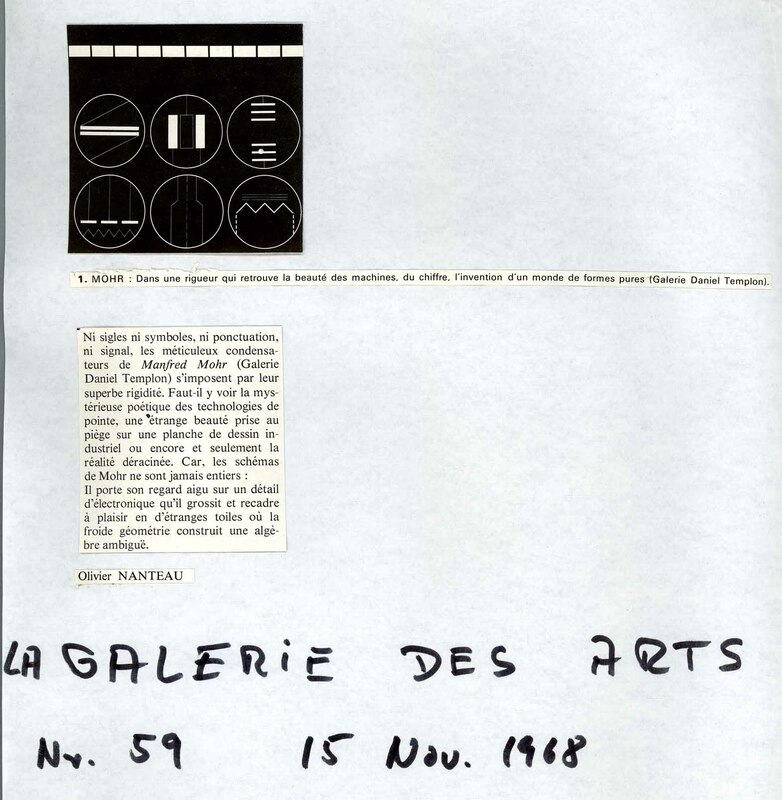 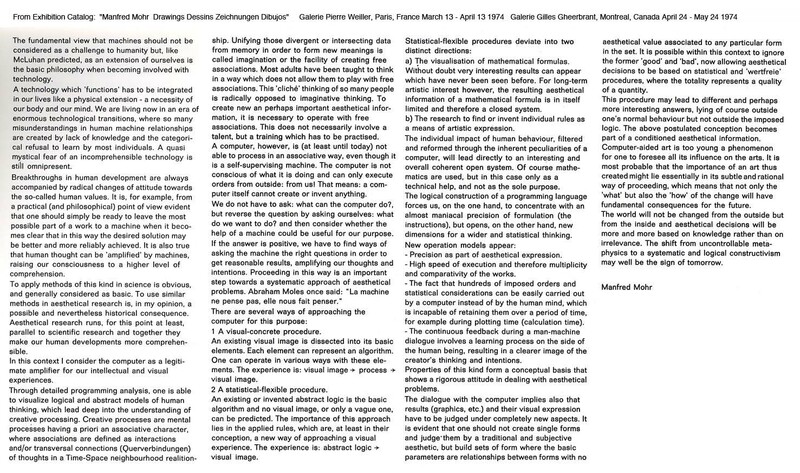 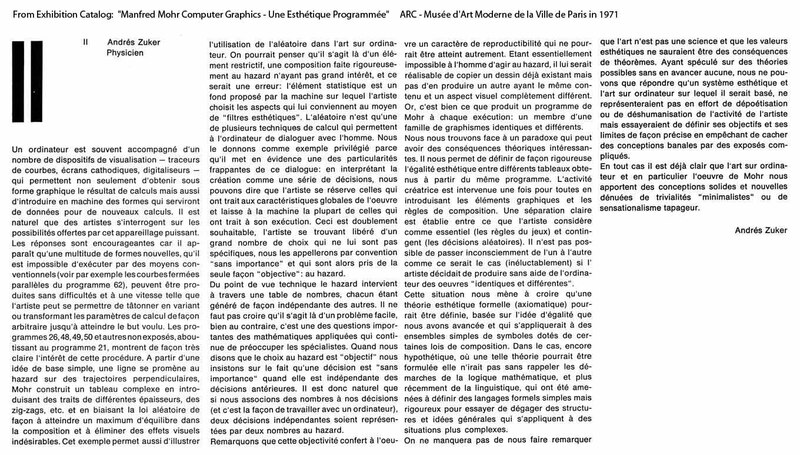 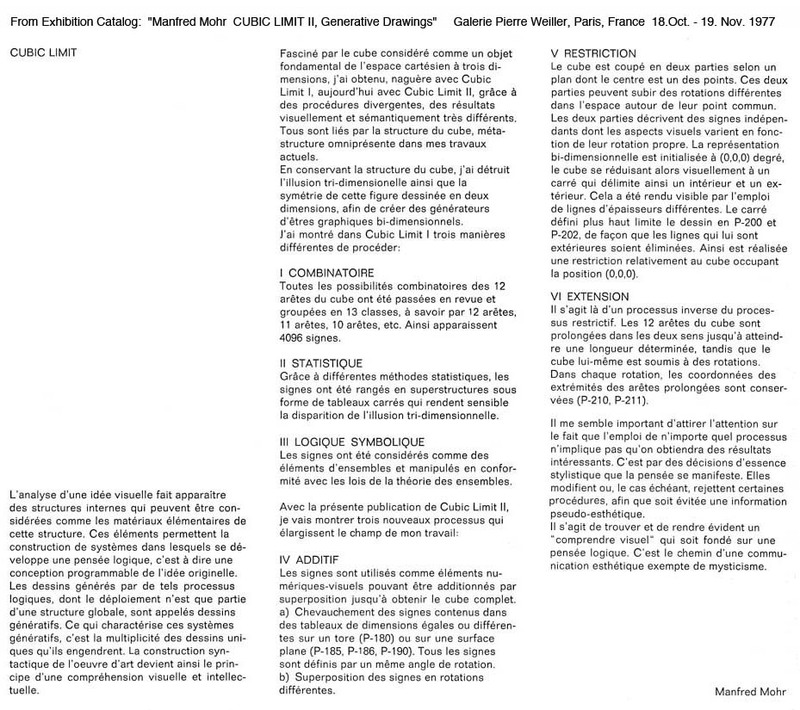 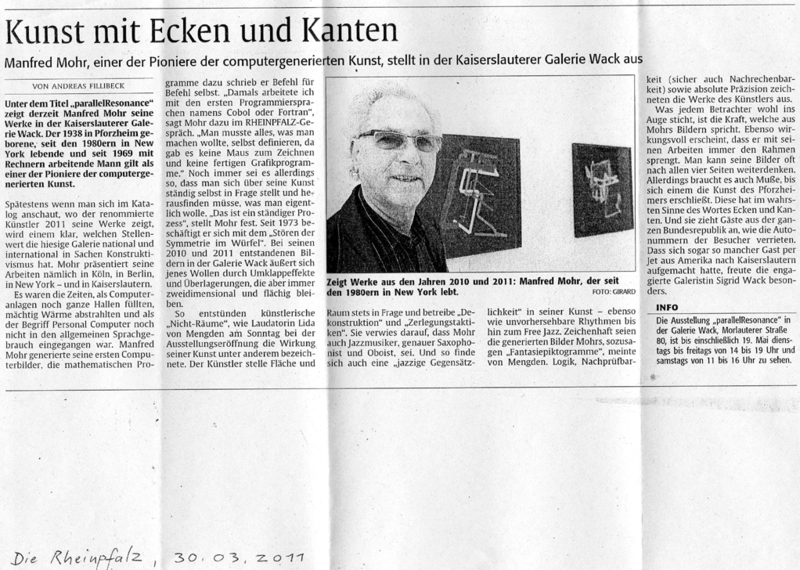 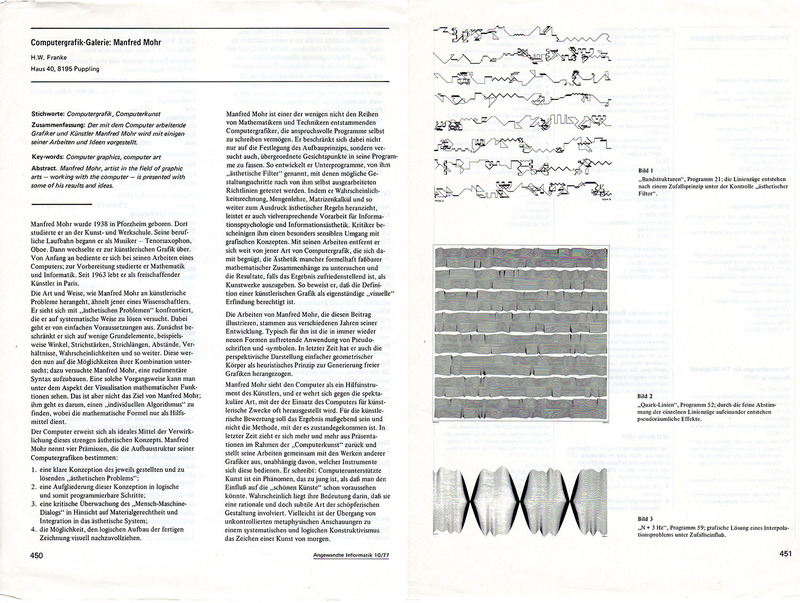 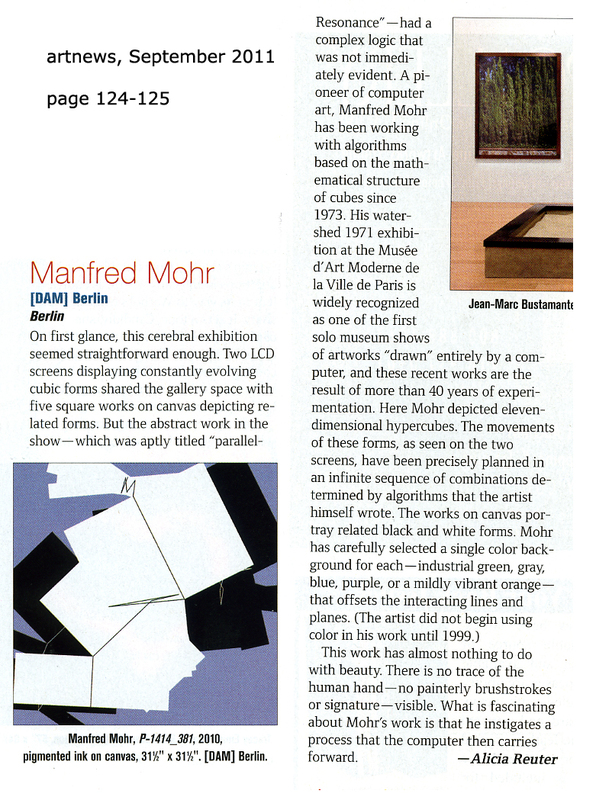 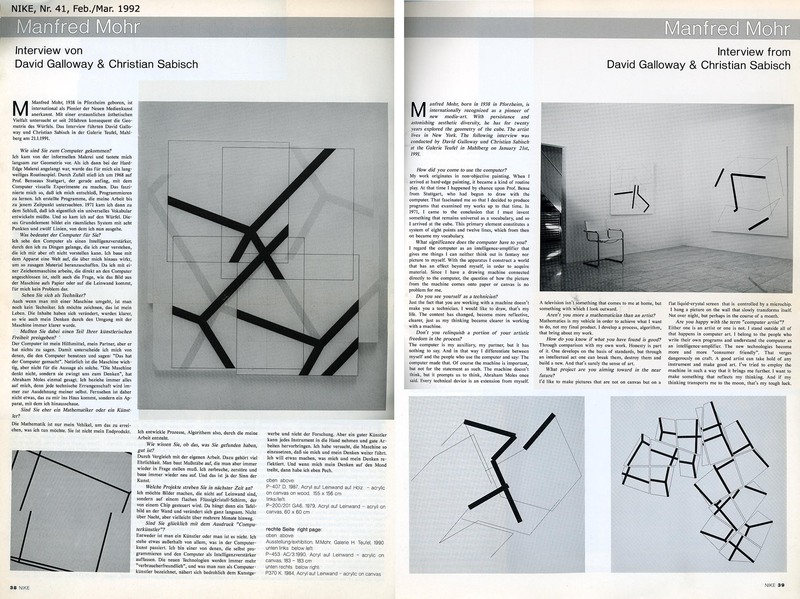 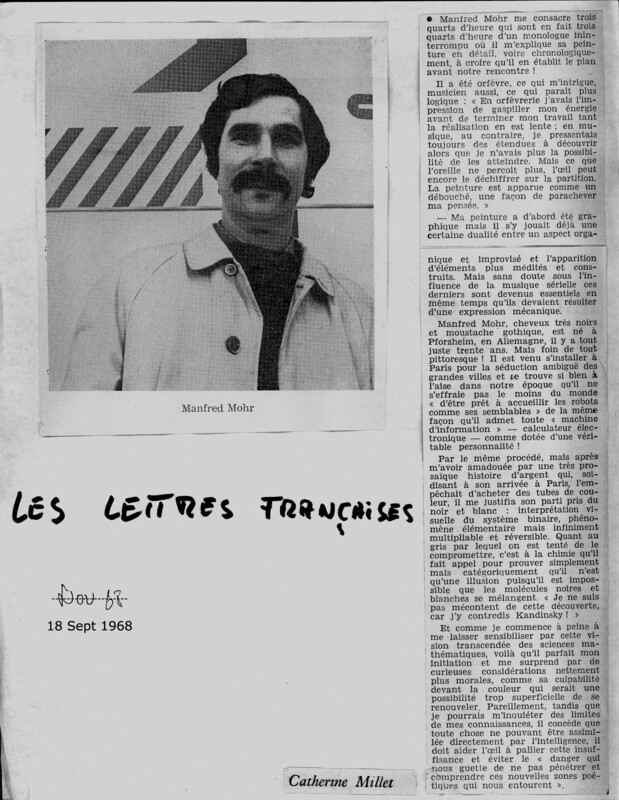 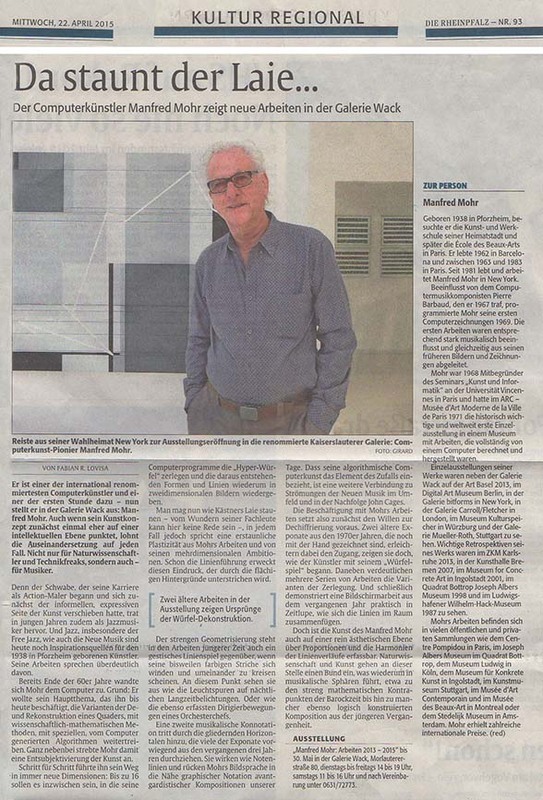 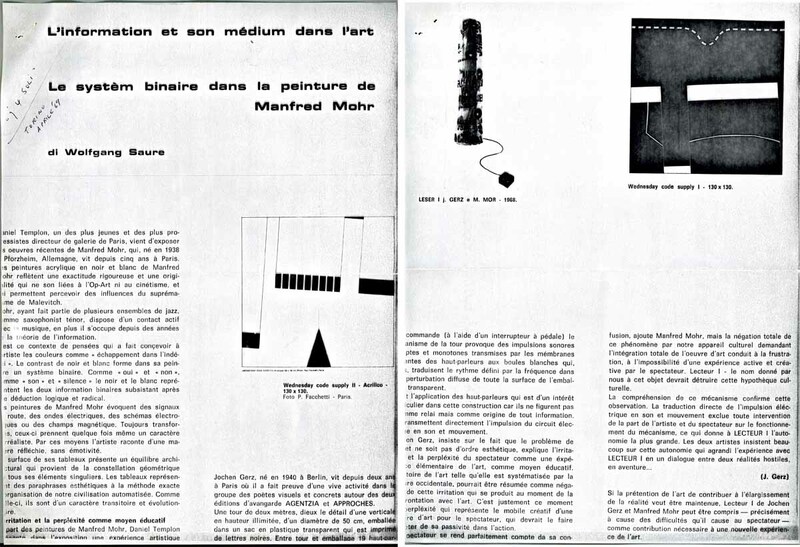 some press about exhibition "Manfred Mohr: 1964 - 2011, Reflexions sur une esthétique programmée"
Jordan Strafer, Manfred Mohr: Generative Artist or Software Artist? 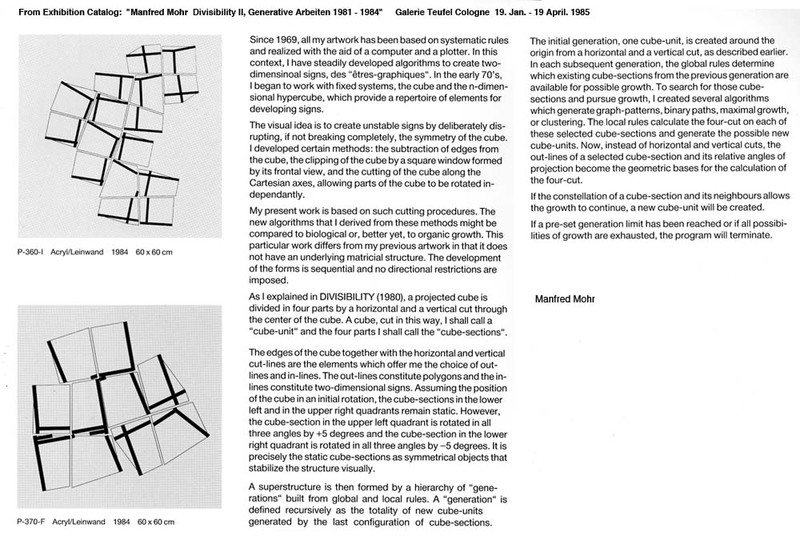 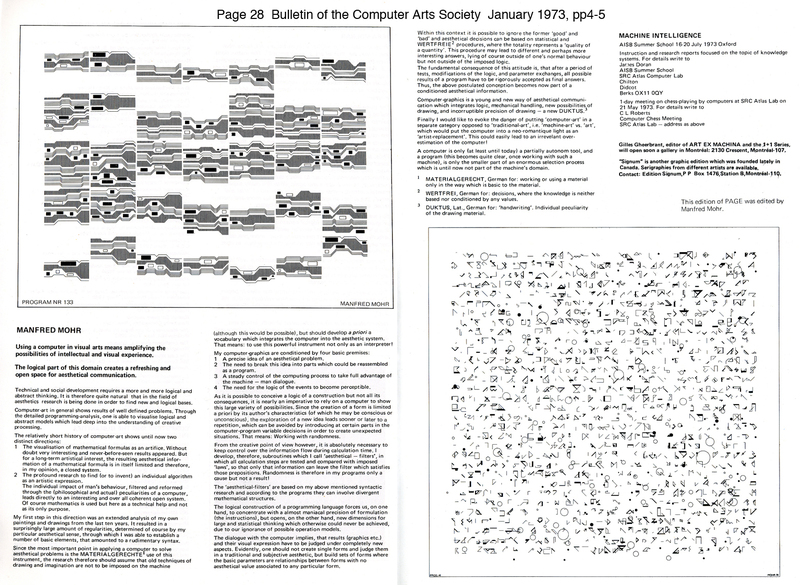 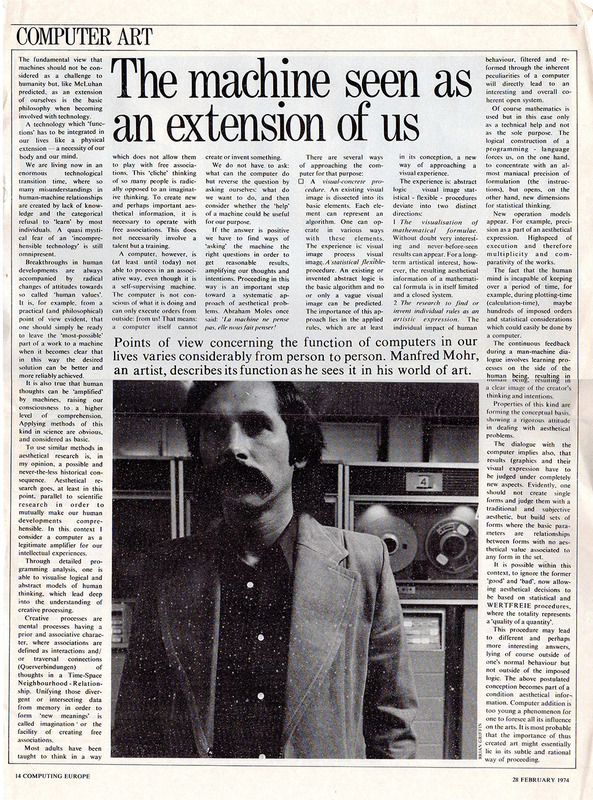 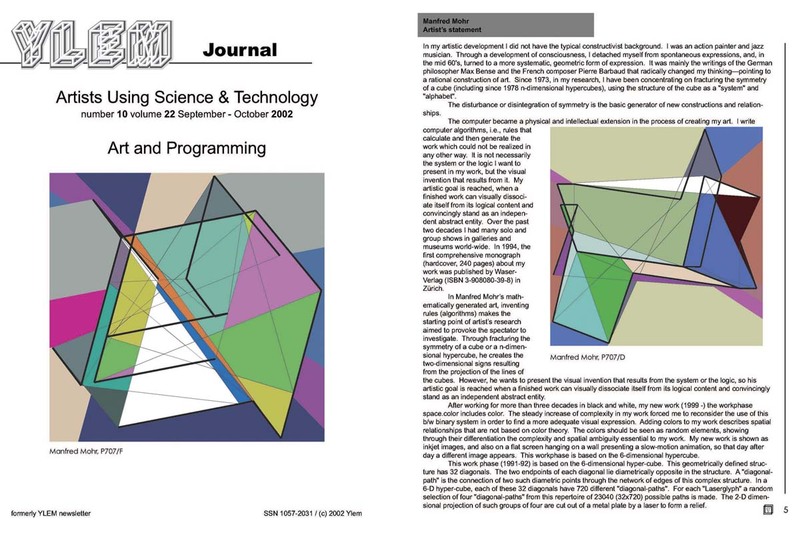 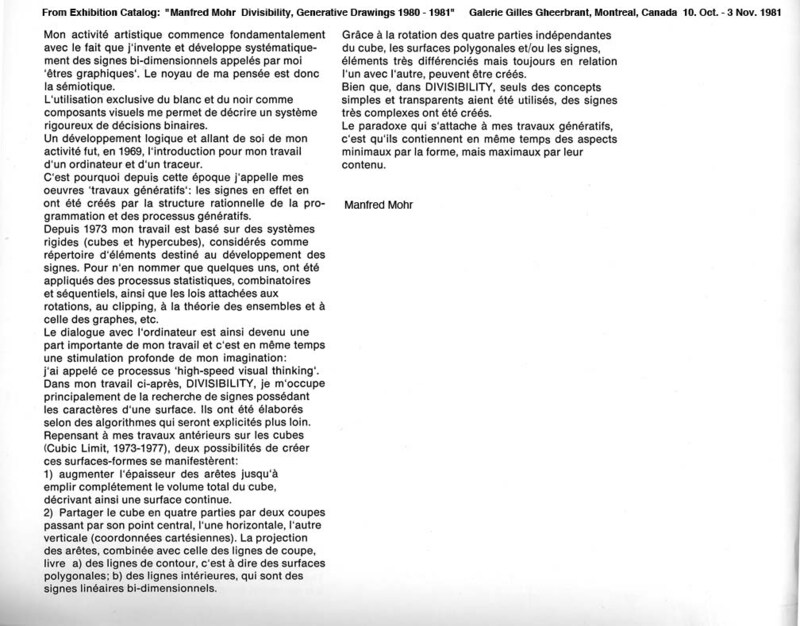 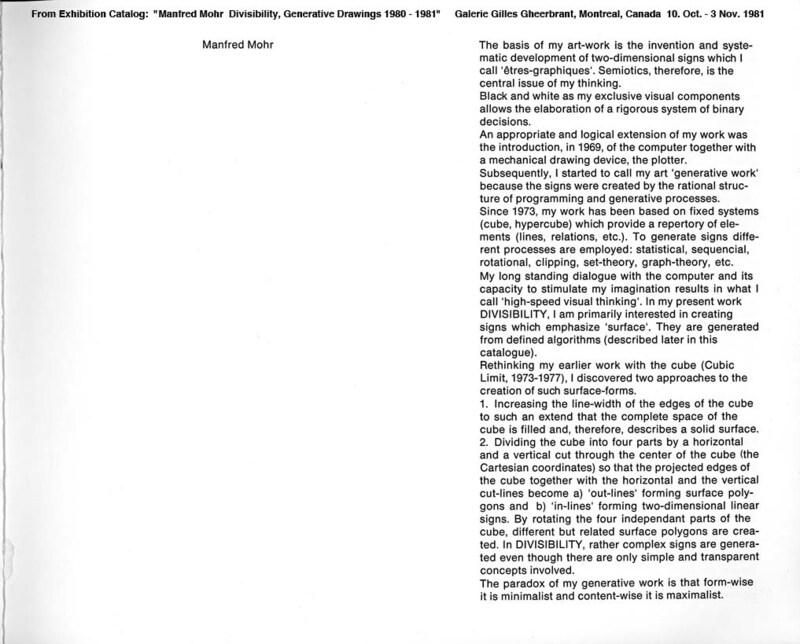 - Mark Sheerin, Is the World Now Ready for Computer Art Pioneer Manfred Mohr? 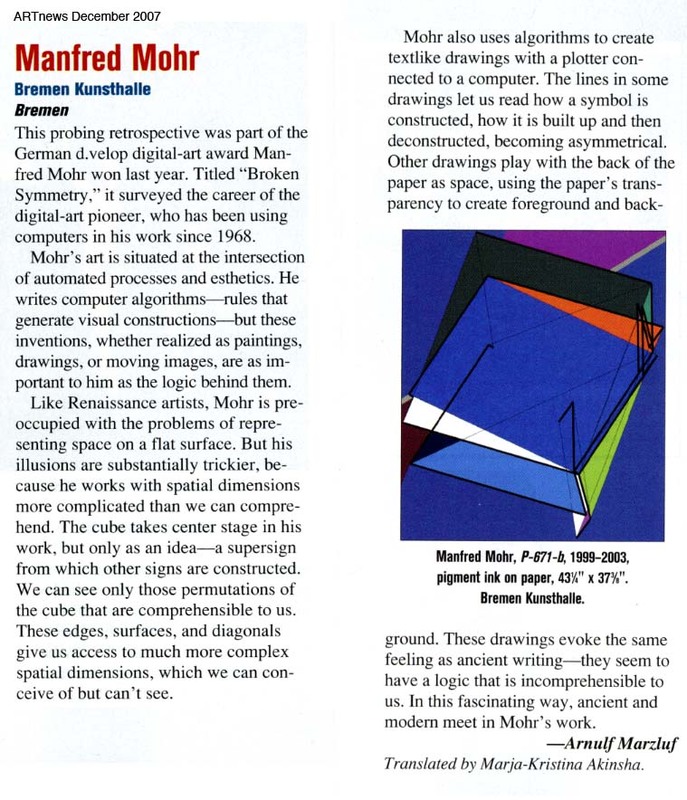 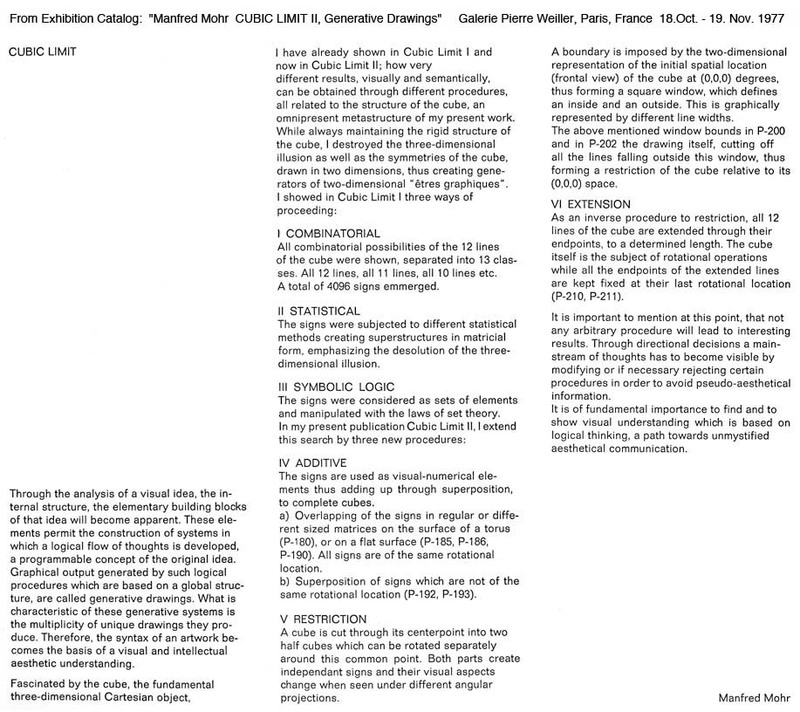 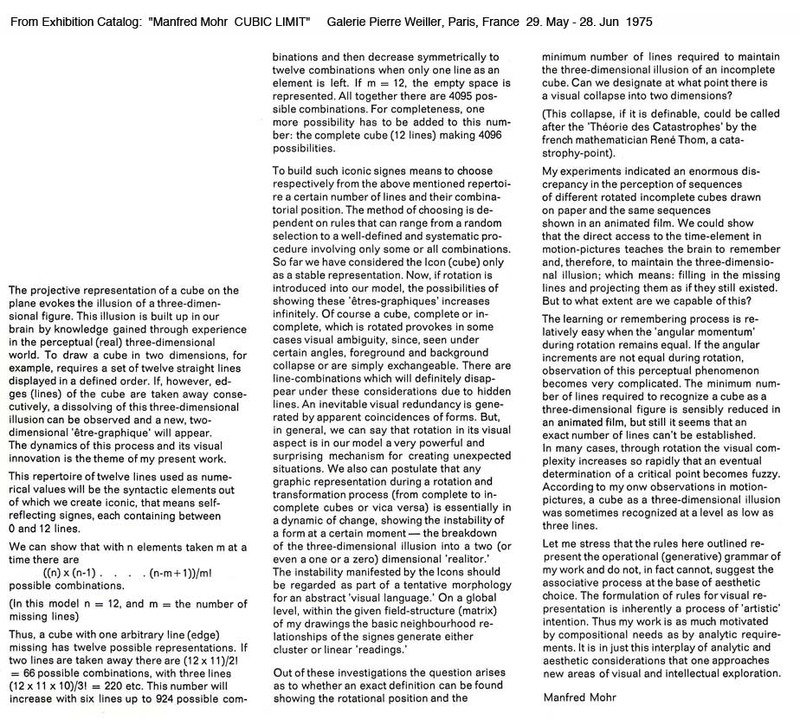 in Catalog "Manfred Mohr Computer Graphics - Une Esthétique Programmée"
in Catalog "Manfred Mohr Drawings Dessins Zeichnungen Dibujos"
in Catalog "Manfred Mohr CUBIC LIMIT"
in Catalog "Manfred Mohr CUBIC LIMIT II, Generative Drawings"
in Catalog "Manfred Mohr Dimensions, Generative Drawings"
in Catalog "Manfred Mohr Divisibility Generative Drawings 1980-1981"
in Catalog "Manfred Mohr Divisibility II Generative Arbeiten 1981-1984"
Manfred Mohr, Douglas Dodds, Jessica Cerasi, "Manfred Mohr in Conversation with Douglas Dodds"
Gerhard Schimpf in interview with Manfred Mohr, "Being Human with Algorithms: Artist Manfred Mohr talks about the Digital Transformation"
- Manfred Mohr, Lecture: "A Programmed Aesthetic"